With M•CARD Online, riders can check their balance, add money (passes or Stored Cash Value) to their M•CARD or even order a new card, all from a computer, tablet or smartphone. The new service also allows people to register their cards in case they are lost or stolen. Click the button below to visit the special M•CARD Online page. On top of M•CARD Online, passengers can still buy and update their smart cards at more than 90 locations across Milwaukee County. No matter how you get your M•CARD, there is no easier or better way to ride MCTS! How do I get an MCTS M•CARD? Riders can get an MCTS M•CARD at more than 90 locations across Milwaukee County or you can buy a card at the M•CARD Online store and have it mailed to you. No matter if you get your M•CARD at a store or online, you can use M•CARD Online to add passes or Stored Cash Value, check your balance and register your card. What is "Stored Cash Value" – Pay-Per-Use? Stored Cash Value is cash value that you load onto your MCTS M•CARD to pay for transit rides. Choose from five different values online -- $5.00, $10.00, $20.00, $25.00 and $50.00 and load up to a maximum balance of $100. Every time you use Stored Cash Value on your M•CARD you’ll save money verses paying with cash ($2.00 vs $2.25). Also, a free 90-minute transfer is put on your card when you pay your fare, so get onboard for $2.00 and the next hour and a half is on us! Can I check my balance on M•CARD Online? Yes. Just register your card at the M•CARD Online store and you can check your balance anytime. Once you are logged into your account, click the "Manage Cards" option in the right-side menu. Then select which M•CARD you would like to review and click the "Transactions" tab from the options below. Once here, you will be able to view the transactions made with your card. Note: It make take up to 36 hours for your most recent transactions to appear online. Can I receive cash back for the remaining balance on my MCTS M•CARD? No, we do not give cash back. Converting your unused or remaining pass days into Stored Cash Value is also not allowed. What is the “one-time” purchase option online? Your 7- or 31-day pass or Stored Cash Value purchase will be loaded to your MCTS M•CARD and charged to your credit card one time. When I use M•CARD Online to add Stored Cash Value or a pass, does it automatically load on my M•CARD? No. To update your MCTS M•CARD with your latest online purchase(s), you must touch your MCTS M•CARD to a farebox on an MCTS bus. When your card touches the farebox, your new product will be activated and used to pay your fare simultaneously. Please note that any products purchased online may NOT be ready for upload to your MCTS M•CARD for up to 36 hours after your online purchase. If you need to refill your M•CARD to ride right away we encourage you to visit a retail outlet. What is an MCTS M•CARD Account? An MCTS M•CARD Account offers customers added convenience and security. 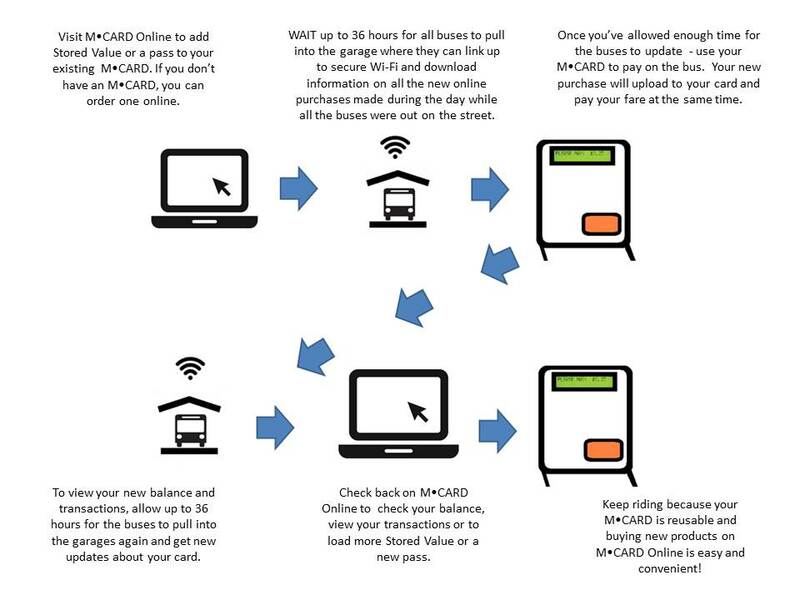 When you register your MCTS M∙CARD online, your account is automatically created. By setting up an MCTS M•CARD account, you can monitor your balance, view your MCTS M∙CARD transactions, add passes or Stored Cash Value or report your card as lost or stolen. How do I register for an MCTS M•CARD account? When you sign up for an MCTS M•CARD account, you’ll enter the serial number (starts with 05-) on the back of your MCTS M•CARD. Can I have more than one MCTS M•CARD per account? Yes. You can add as many MCTS M•CARDs to your account as you would like. This is a good option if you are managing multiple cards for yourself, family members or others. I need to manage a large number of MCTS users through my organization. How can I do this? MCTS has several options that can work for large organizations or non-profit groups that need to provide MCTS fares to their members. Please contact MCTS M•CARD Services at 414-937-0470 or 711 (TRS) or send an email to mcardservices@mcts.org to discuss solutions with a member of our team. Our staff is available to help Monday through Friday from 8:00 a.m. to 4:30 p.m. I am locked out of my account,–what should I do? If you are locked out of your account, please contact our MCTS M•CARD Services at 414-937-0470 or 711 (TRS) Monday through Friday from 8:00 a.m. to 4:30 p.m. Customers can also email their questions to mcardservices@mcts.org. Please include your M•CARD number (starts with 05-) in the email. I know my username and password information are correct, but I still can't log in. What am I doing wrong? Your log in information is case-sensitive. Please make sure you are entering it correctly. I'm having trouble accessing M•CARD Online. What should I do? Firefox 23, Chrome 22, IE 8 on Windows 7, Edge, Opera 17, Safari 7, Android 4.1 and/or Java 7 or above. It can take up to 36 hours for new purchases to be available on your M•CARD. If you received confirmation that your purchase was made, but is not available on your card, you most likely will need to allow more time for all the buses to pull back into the garages and get all the necessary updates about recent online purchases, including yours. I’m a registered user and I’ve made purchases before with the same credit/debit card – why isn’t my billing information saving? Select the second option and enter your credit/debit card information. Scroll to the bottom and hit the “Update My Information” button. Your payment card information should now be securely saved to your account so you should not have to enter it the next time you make a purchase. I tried to register/add my M•CARD but it says the card was never issued. This message can be the result of a couple things. If you recently purchased a new M•CARD from a sales outlet, you may have to wait at least 24 hours after the initial purchase for the card to be recognized as "issued" meaning it has now been marked as an M•CARD that is out in circulation. Just give it a little more time and try to register again. If you are trying to register/add a photo ID or program based pass such as CVP, U-PASS or GO Pass, you will not be able to register your card. Being a member of those programs already gives you many of the benefits of being a registered card member, so you're already covered! I tried to make a purchase and it says “Authorization Failed”. If you attempted to make a purchase with a valid credit/debit card and received a message that looks like the error message below, it means there is an issue with your payment card information. Double check that you have typed in the credit/debit card information, including your name, EXACTLY how it appears on your card. Your billing address also must match the address your credit/debit card provider has on file. If the address is off by even one digit, your transaction will not be processed. If you are using a card issued to you by your employer, make sure you have verified the correct billing address associated with that card – it may be your home address, your work address or an alternate address for your employer. Contact your transit benefit coordinator for additional assistance.